The maiden state conference of the Tamil Nadu Lorry Drivers’ Union took place in the city on Wednesday during which, members of the union demanded the Centre to refrain from passing the Road Safety and Transport Bill, 2014 in Parliament. The bill is currently at the working draft stage. The members of the union also called for revision of the toll fee all over the country, insurance fee, stabilisation of service tax and reduction in the price of diesel. 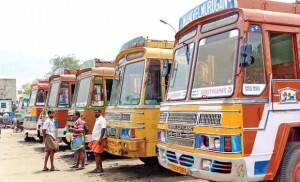 They passed a resolution demanding a separate welfare board for lorry drivers and the inclusion of lorry drivers in the Road Safety Councils formed by the government, on the grounds that they have more practical exposure and experience when it comes to driving, compared to officials and technicians. The members also demanded formal employees’ state insurance (ESI) and provident fund (PF) to be provided to lorry drivers, along with their salaries. Another resolution, passed in the meeting, called for a fair inquiry into accident cases, as the drivers are always blamed on such occasions notwithstanding other factors contributing to the mishaps. They also demanded that accident cases be filed at the jurisdiction of the place of registration of the vehicles involved, as it is difficult for the drivers concerned to frequently travel to other places in connection with mishap cases.